Heat a few drops of oil in a non-stick pan and fry the onions and garlic until lightly browned. Sprinkle in the coriander, cumin and cayenne pepper and allow to sizzle for 30 seconds. Pour in the tomatoes and season with pepper and a pinch of sugar. Cook briskly, uncovered, stirring occasionally, for 5 to 6 minutes until the sauce thickens slightly. Roughly flake the pilchards in their sauce with a fork, add to the tomato sauce and heat through. Ideally use curried pilchard cutlets or just add a little curry powder with the other spices to the fried onions and garlic when using pilchards in tomato sauce. While preparing the sauce, cook the spaghetti until tender in boiling water. Drain in a colander. 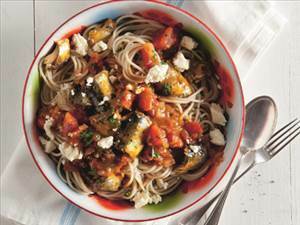 Place spaghetti into warm serving bowls and top with the pilchard tomato sauce. Sprinkle with feta and serve with salad. 48 members have added this recipe to their cookbook. The only thing I would change is. Remove the bones of the pilchards. A relish of grated carrot and baked beans. There are 404 calories in 1 serving of Curried Pilchard Spaghetti. Calorie Breakdown: 30% fat, 45% carbs, 26% prot.